Tented safaris were initiated in Kenya around the 1920s and '30s but the concept has now spread to cover most of Africa's wildlife areas. 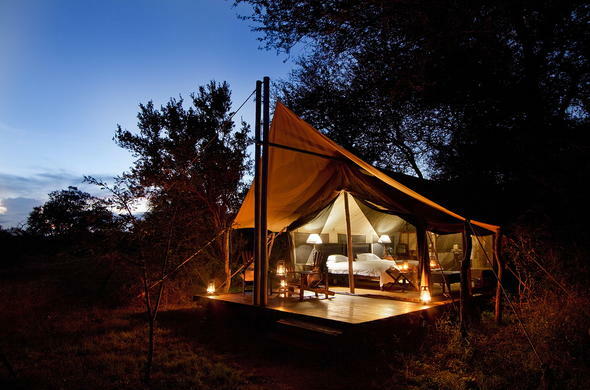 Camp is usually established for two to four days in each ecosystem and guests stay in upmarket lodges while it is relocated. There is probably no other subject relating to African travel that is as misunderstood as that of 'the tented camp'. A huge range of products are hidden behind that one label. We endeavour to help you make some sense of it. When he was first told that his US$275-a-night accommodation in Botswana would be in a tented camp, Mark Swanson of London was horrified. 'I'm not paying $275 for a camping holiday!' he gasped. 'Aren't there any hotels in the Delta?! His travel consultant then had to explain that his tented camp had solid teak furniture, feather pillows, an en suite bathroom with hot running water, electricity and a plunge pool built in to the verandah deck. Waiters would serve him three course meals with chilled wine in the evenings and wake him with hot coffee or tea in the morning.There certainly aren't any hotels bang in the middle of the Okavango Delta, but then he did want to go on safari to an untamed part of the African wilderness. The one thing Mr Swanson could have been sure of was that he was not alone in his reaction. Members of the African travel trade report that the issue of the tented camp is probably the most misunderstood of any they discuss with their clients. On one hand, you can spend US$85 a night on a full participatory walking safari while on the other, a luxury mobile safari operator in east Africa who has hosted royalty could charge as much as $800 a night.In the last 10 years or so there has been a proliferation of tented camps throughout east and southern Africa, born out of a combination of necessity and the saleability of the romantic 'Out of Africa' image of the safari heyday of the 1920s and '30s. Tented safaris were initiated in Kenya around this time but the concept has now spread to cover most of Africa's wildlife areas. In truth, however, today's top-end mobile operators in east Africa are the only companies that provide a safari of this ilk, with a few exceptions. Usually catering for an exclusive party of about six people for the duration of their trip, these outfits offer tremendous flexibility and perhaps the most private experience. Genuine luxury is provided and the staff to client ratios and standards of service and food are very impressive. Clients are on safari for an average of just over a fortnight. Camp is usually established for two to four days in each ecosystem and guests stay in upmarket lodges while it is relocated. This requires good logistical support and each trip is accompanied by a staff of at least 12.In addition to drivers and a re-supply crew, there are people to look after the tents, prepare meals and service the dining tents. The guide to client ratio averages one to four or five. Given this level of support, it is not surprising that luxury mobile operations carry a heavy price tag, with rates ranging between $400 and $800 per person per day. But pack away the silver service, introduce lighter and fewer furnishings, do away with electricity generators and reduce your staff compliment to about four per every eight guests and you're nearer the vast majority of mobile tented operations. Because tents are easily dismantled and moved, they are used on most walking or canoeing safaris, such as those along the Zambezi river in Zimbabwe and in parks like the Luangwa in Zambia.Most maintain sufficient logistical support and have suitably versatile guides to ensure that everything is done for the clients: camps are set up before the party arrives and dismantled after it has left, usually the next day although some are used for longer. As with all mobile operations, nothing is left behind. These tented camps may not have the trimmings of the luxury outfits, but they are practical, comfortable and offer an intimate African experience. With activities included, trips average between $150 and $300 per person per day, but prices depend on the nature of the safari and do come down when companies require client participation. On some walking safaris, for example, clients are required to carry their own tent and provisions in a rucksack and are expected to help establish and dismantle camp as well as assist with the meals. Generally these trips appeal to those who want a more adventurous safari and very close contact with the wilderness. On such trips the tents tend to be one-or two-man styles and the prices range between $85 and $175 per day. The biggest increase in tented accomodation has come from permanent or semi-permanent camps, most of which have been built in the last 10 years in response to greater tourist demand. The definition of semi-permanence appears to vary but generally they have to be able to be demolished and removed in their entirety within 24 hours.Some in this category suffer seasonal constraints and are only open for a part of the year. On average, camps have between eight and 40 beds and prices range from about $150 through to as much as $400 per person per night. There can be no doubt that these establishments are trading on the saleability of the tented concept generated by mobile safaris. In most cases, they offer a very high standard of accomodation and service - not unlike that you would receive in a top hotel - in some very out of the way places. They promise the experience of living under canvas in the African bush with the reassurance of reliable services and comforts.But even here there is a wide range of quality on offer. Price is often a good reflection of standards, but you would do well to ask as many questions as you can about the camp before confirming your booking. Most companies are careful to give you lots of pre-tour information but you want to be sure you are happy with the range of services offered. Mr Swanson was. With special thanks to Peter Silvester, Royal African Safaris, east Africa; Brian Worsley, Wilderness Safaris, southern Africa; and Garth Thompson, Natureways, Zimbabwe, for their assistance in compiling this feature. The Tents: Are they walk-in or crawl-in? How big are they and, if guests have to erect them, how simple are they? Are they mosquito proofed? Permanence: How often does the group/camp move and what involvement will I have in these moves? Service: What service is provided and what will I be expected to do around camp? Ablutions: Is there hot water available for washing and what toilet facilities are provided? If they are separate, how far are they located from the tent? Even if you are only given a spade and toilet paper, it helps to know beforehand! Communications: Does the camp have radio contact with support services, especially medical rescue? Location: Is the camp inside or adjacent to a national park? Is it situated in an exclusive area or a public camp site? You might want to avoid being able to see other camps from yours. Your Guide: Who is leading the safari or managing the camp? It helps to know how experienced your host will be. Safety in Camp: With most camps being located in unprotected areas of the wild, there is a chance wildlife could wander through your camp. What precautions are in place for your protection in case of an emergency? Health and Dietary: Depending on the mobility and power supply of each camp, it may be wise to check where vegetables, meat, ice and other foodstuffs are being purchased and stored in order to maintain freshness. Activities: Finding out what daily activities are planned or are on offer will help you and your hosts to put the time available to the best possible use. Copyright © 2004 Travel Africa Magazine. All rights reserved. Reproduction in whole or in part without the permission of the author is prohibited.